I just learned to crochet this February. So if I can make this throw blanket, anyone can make this blanket! In fact, anyone with even the most basic crochet skills could make this blanket without a tutorial. 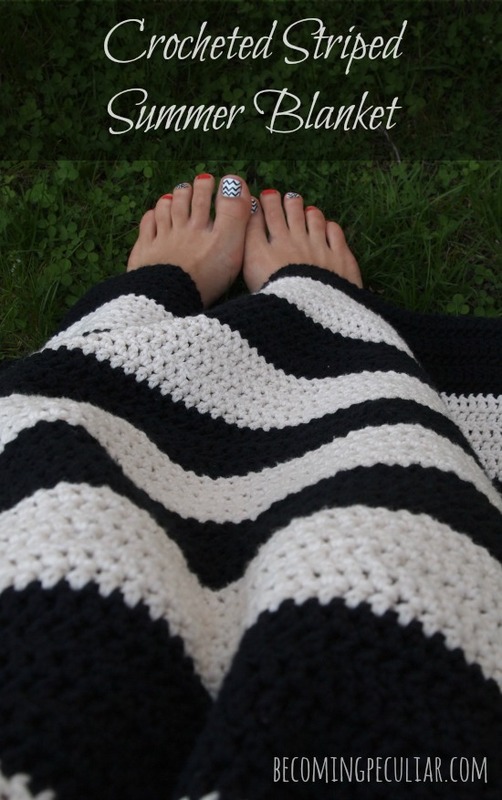 It’s just double crochet throughout, switching between black and white. If you can do that one stitch (and switch colours), you’ve got this! Read on to learn more! 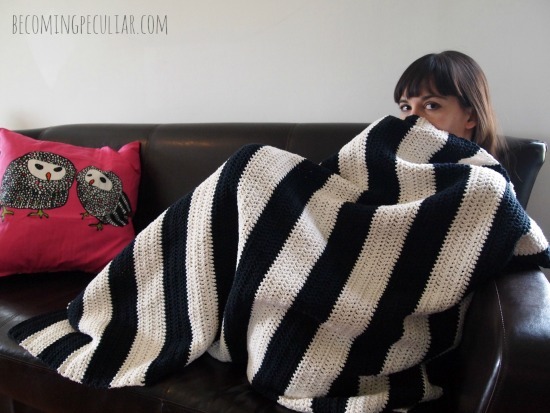 I’ve wanted a black-and-white striped blanket ever since I saw Ikea’s. (I’m always a sucker for black-and-white stripes. I’m mad about the Scandinavian look.) But the Ikea one is made of acrylic, and I wanted natural fibers. As I started to learn crochet, I quickly fell in love with cotton for its drape. Unlike acrylic, which can often give you a stiff end-product, cotton just envelops you in its drapey folds. For me, that’s an ideal characteristic in a blanket. Forget fluff and fuzz. I want a blanket to flow over me like a warm, full-body hug. This one does just that. Organic cotton would have been ideal, but I didn’t want to spend too much on a beginner project in case it didn’t work out. 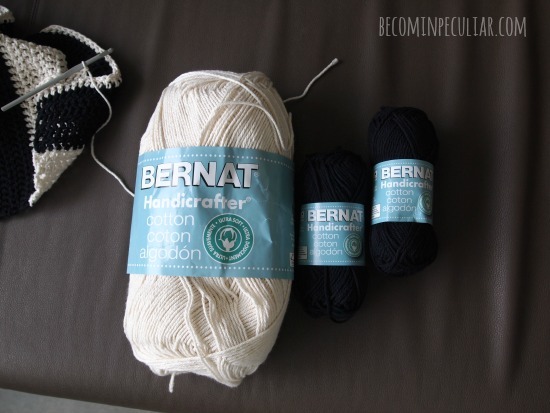 So I went with Bernat Handicrafter Cotton, which is inexpensive and you can get it just about anywhere (including Wal-Mart). I spent $28 on yarn for this project, which is pretty decent for a good-sized throw blanket. Like I said, this pattern is so basic you don’t really need a tutorial. I came up with it on my own and I’m a total newbie. I’m offering instructions mostly so you can predict the dimensions. I’ve done the test swatches and the math to get you a 3-foot x 4-foot blanket, which I consider just right size for snuggling on the couch with some popcorn and a movie. It won’t take you a million years to finish but it’s definitely big enough to keep your feet warm or drape around your arms and shoulders comfortably. Moreover, this pattern produces the least amount of waste if you’re using the small balls of yarn I used. Each stripe uses up (almost) exactly one small ball, so you’re not left with a bunch of useless scraps. And the small balls might be all you can find, as they’re readily available all over the place. (I’ve seen them at Wal-Mart, Michael’s, and even a discount yarn warehouse.) The larger ones are a lot harder to find — white is often all they have in stock (if anything). Each stripe is 6 rows of 112 double-crochet stitches (except the first stripe, which has the additional chain.) Each stripe uses up one small ball of yarn. I prefer to weave in ends as I go. (Not the stripe I’ve just finished, but one or two behind.) That way I’m not left with all the boring weaving at the very end. I don’t use the “cheating” method of crocheting over the tail because I think it’s more noticeable, and easier to pull out/unravel later. I want this blanket to be able to withstand dozens of washes. Row 1: Using the H hook, double crochet into the 4th chain from hook. Double crochet into every stitch across. (112 stitches.) (Note: for this step, I prefer to stitch into the bottom of the chain, so you get a nice finished edge at the bottom that looks just like the top. Do whatever you prefer.) Turn your work. If you’re using the small balls, this should pretty much use of the whole thing, leaving a generous tail to weave in. If you’re working from a large ball, trim yarn, leaving about 6 inches to weave in later. Change colours. (I use this method from Rescued Paw.) Using double crochet, crochet 6 rows rows of white as above. Repeat, alternating between black and white, until you’ve used up all your yarn. *If you do 9 stripes of each colour (18 total), your blanket should be about 4 feet long. *I actually bought an additional ball of black yarn and added one more black stripe to the end, so that it begins and ends with black. I thought white on the end might get grubby-looking quicker. So my blanket is about 4’3″ long. *Weave in ends as you go. I use this method from Crafty Minx. Tada! Time to get cozy! And hey! Because it’s made of cotton (read: breathable and light), it’s actually perfect for taking outside on a cool summer night. 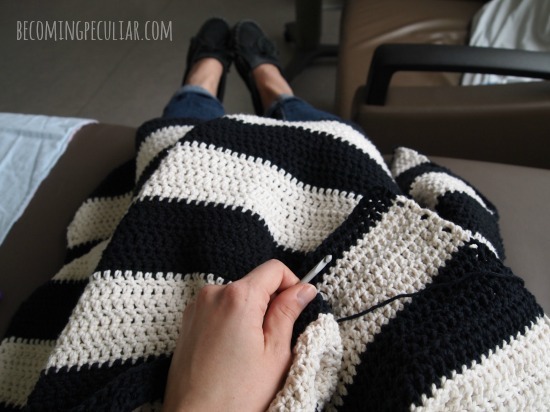 PS – I made this blanket while in the hospital. 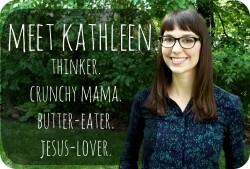 You might be interested in: Crochet Helped Me Survive Trauma. Thanks for sharing this! I love your black and white blanket and might have to be a copycat! I’m new at crochet too and have only done a few scarves, both in solid colors (read: boring). 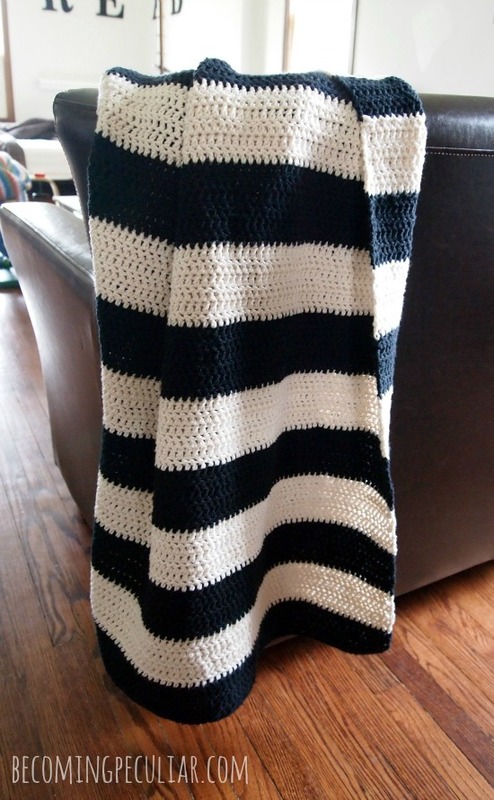 Since I’ve been wanting to start a blanket and do a striped one, this is perfect. Sending it now :) Have a great day! I’m hoping to crochet a similar-looking blanket in one-month’s time for one of my nieces for Christmas. The center will be horizontal black and white stripes and on either end will be vertical black and white stripes. Wish me luck! How many rolls of white n rows of black does it take!